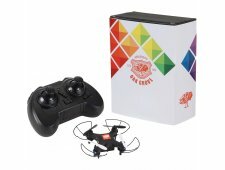 The Mini drone with camera is pocket size drone but demands attention. The drone featuers a 480P camera capable of taking photos and vidoes. The auto-hover function allows for easy control during flight. It also features headless mode and one button return. Simply charge the drone and your fun begins. Capable of flying up to 160 ft. for 5 minutes on a single charge. It takes 30 minutes to charge the drone from 0 to 100%. The remote includes 2 AA batteries. Micro SD Card not included. 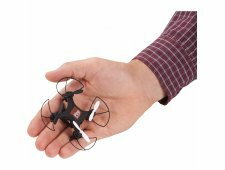 The Wifi Remote Control Selfie Drone is a pocket size drone but demands attention. The drone features a 480P camera capable of taking photos and videos. The Wifi function allows you to control the drone and camera with your smart phone. When in Wifi mode the images can be transferred to your phone immediately. The auto-hover function allows for easy control during flight. It also features headless mode and one button return. Simply charge the drone and your fun begins. Capable of flying up to 160 ft. for 7 minutes on a single charge. It takes 30 minutes to charge the drone from 0 to 100%. The remote includes 2 AA batteries. Micro SD Card not included. 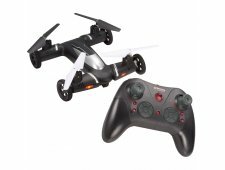 Remote Control Drone with Camera and GPS includes all of the features of a professional drone. Through the provided App you are able to see live video from your flying drone and save the images/videos immediately. Plus you are able to fly the drone from any smartphone. 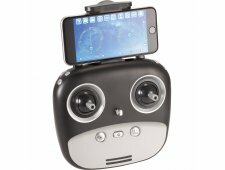 This allows you to take great aerial videos or photos from the HD 720P camera. 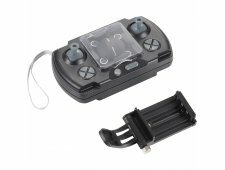 With the GPS function activated the drone can return to its take off point with a simple push of the button. This drone also features a "follow-me" function that will follow your movement. The flight time is 10 minutes on a single charge. The drone is capable of flying up to 984ft. from the user. Assembly required.